What is a Bayer filter? Both CCD and CMOS image sensors start at the same point where they convert light into electrons in form of accumulated charge. The next step is to read out this charge of each cell and to digitize this information to make it computer readable. In a CCD device, thecharge is transported across each cell to the “corner of the chip” and read out serial. In most CMOS devices, there are several transistors at each pixel that amplify and move the charge in a more direct way and/or parallel to the digitizer. 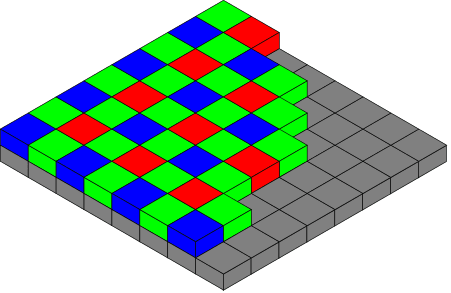 The CMOS approach is more flexible because each pixel can be read out individually. Most of today’s high speed cameras are using CMOS sensors. What are high speed cameras? Unlike standard video cameras that are capturing sequences at 20, 30, or even 60 frames / seconds, high speed cameras can record up to millions of frames per second. High-speed digital video cameras are very useful instruments to diagnose and analyze high speed processes. A high speed camera captures sequential images at a very high speed, called the framing speed, stores the image data in a memory and make it available for playback in slow motion to allow the viewer to see, measure and understand events that happen too fast to see by the bare eye. High-speed video helps you understanding your fast mechanical events. Whether your work involves product design, research, automotive crash testing defence applications such as airborne store separation tests or sports and biomechanics, a high speed camera is a versatile tool to understand what is going on in the short period of time. The shutter speed defines how much light is allowed to be captured on the sensor. This duration will be either equal or less than the frame rate. Think of a shutter as a window shade. Then, for a defined period of time the shade (shutter) opens and then closes. The time the shade is open is called the shutter speed. A shorter shutter speed will “freeze your motion” on the scene while taking the same scene with a longer shutter time results in smeary images. The shutter speed is set independently of your frame rate. FPS is the short form for “frames per second” and represents the number of images taken by a digital or analog camera. This number is used in conjunction with movie and / or high speed cameras and represents “how many images per second are taken”. Example, 30fps stands for 30 images taken per second, 1000 fps of a high speed camera represents 1000 images taken per second. It is important to control the amount of light that reaches the sensor surface. Too much light result in “white images”, not enough light in “dark images” The amount of light reaching the sensor surface is controlled by the aperture. The aperture is the size of the opening in the lens in front of the camera. A smaller aperture gives you a larger depth of field (the image seems in focus over a longer distance) while a larger aperture gives you a reduced depth of field. Increasing the amount of light on your subject will allow you to close your aperture and thus giving you a more in-focus image and a deeper depth of field. The focal length is defined as the distance between the lens and the surface of the sensor. For C-Mount this distance is set to 17.54mm. Further, the focal length is the critical information determining how much magnification you get when you look through your camera. Increasing the focal length results in a greater magnification (“objects appear closer”) There is a wide variety of lenses available ranging from fixed focus, Zoom lenses to macro lens systems. Rolling shutter is a method of image capture in which a still picture (in a still camera) or each frame of a video (in a video camera) is captured not by taking a snapshot of the entire scene at single instant in time but rather by scanning across the scene rapidly, either vertically or horizontally. In other words, not all parts of the image of the scene are recorded at exactly the same instant. (Though, during playback, the entire image of the scene is displayed at once, as if it represents a single instant in time.) This produces predictable distortions of fast-moving objects or rapid flashes of light. All high-speed cameras we sell are global electronic shutters and do not exhibit this phenomenon. A global shutter, unlike the rolling shutter, exposes all pixels at the same time; therefore is no time discontinuity in the image. The global shutter has a storage element that allows the pixel to dump the storage charge into a shielded area. This shielded area than can be read out while the next image frame is being exposed. Therefore, there are no discontinuities or image artifacts associated with the electronic exposure. All cameras we offer for sale are global shutter cameras with the exception of the Shimadzu HPV-2 / Photron IS-1M camera. Depth-of-field (DOF) is the range in which an object would be in focus within a scene. The largest DOF is achieved when a lens is set to infinity. The smaller the f-stop the smaller the DOF. If the object is moved closer to the lens, the DOF also decreases. Lenses of different focal lengths will not have the same DOF for a given f-stop. High-speed cameras currently use two principal types of recording medium, DRAM memory and solid state storage media. Most cameras use solid-state DRAM memory and the most useful recording mode with this memory is called continuous record. This mode is also commonly known as end trigger mode or circular buffering. In continuous record mode the camera records non-stop, replacing its oldest images with the newest images until an event occurs and triggers the camera to stop. Further flexibility allows the operator to program exactly how many images before and after an event are saved. For engineers and technicians trying to record something unpredictable or intermittent, the continuous-record with triggering is the only feasible method of capturing the event.